A little grey mouse called Delia lives in a hole in the bottom of a tree in a small square garden (A). The garden is paved with 6 large square paving stones in each direction and has a circular pond right in the middle that has a diameter of 3 of the paving stones. Delia's tree is at the left hand corner at the bottom of the garden. 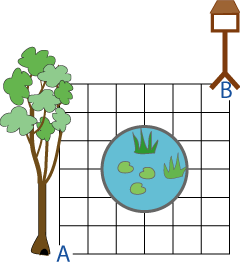 At the top right hand corner of the paved area there is a bird table (B). Each night Delia runs along the edges of the paving stones, avoiding the pond, to collect up the bits that have been dropped by the birds. She likes to go a different way each night but she always takes as short a route as she can, towards the top of the garden and to the right. How many days will it be before Delia has to take the same route again? Interactivities. Addition & subtraction. Networks/Graph Theory. Visualising. Factors and multiples. Working systematically. Multiplication & division. Route inspection problems. Combinations. Investigations.